JOHANNESBURG – July 07, 2015 –Thousands of visitors braved the cold in Sandton, Johannesburg yesterday, ensuring their entrance to the opening day of Markex 2016, the targeted promotional product expo. Markex is running from 6 to 7 July 2016 at the Sandton Convention Centre. We visited the show to see what the show is about and recorded some of it in 360° video. 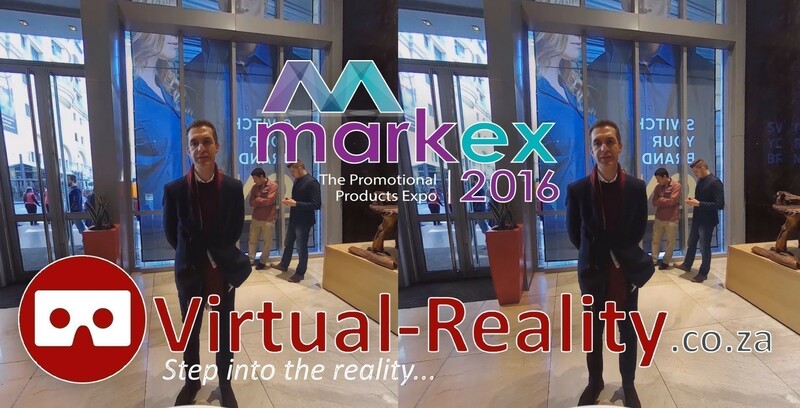 You can watch the 360 videos below or on the Virtual Reality YouTube channel, or using your virtual reality headset or Google Cardboard device to immerse yourself into the Sandton Convention center and Markex event. The Market Exhibition Organizers had a singer performing at the ticket area of the Sandton Convetion Center. The singer provided a awesome atmosphere at the entrance of the exhibition and we thought that it was quite clever of the organizers to have him there. The singer provided some entertainment while people had to wait in the queues to register and get there tickets for the Markex exhibition.